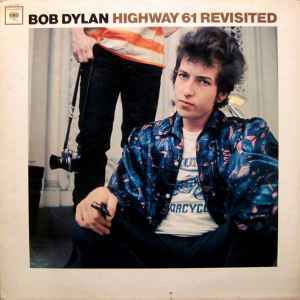 Pressing Plant/Rear Cover Variation to Bob Dylan - Highway 61 Revisited: Columbia Records Pressing Plant, Pitman / Number 7, Rear Cover, Bottom-Right - see scans. How to make the best album ever: Start off with the best rock song ever written, snarling, spitting venom, likely to bite anyone dumb enough to come close. Add seven absolutely flawless songs. End with 11 minutes plus of the best song ever, it's not rock and roll, it's not really folk, it's that unique Dylan genre, it's Desolation Row and it just never ever gets any better than this. "At midnight, all the agents, and the super human crew..." Shivers down my spine after 1000 listenings. From Like a Rolling Stone to Desolation Row and not an ounce of fat between the finest surreal images in all contemporary music. The greatest album ever made. If you were to only bring one album to a desert island, this is it!